Just think of the anxiety that precedes a job interview, date, wedding or any other big event - stress has an adverse effect on the body and can bring on a cold sore outbreak, as can other immune system stressors such as other viral infections like a cold or flu. Knowing exactly how to get rid of a cold sore can be crucial to your feelings of well being, especially in face of such situations and while there is no right time for a cold sore outbreak to occur, they always seem to appear at exactly the worst possible moment in your life, probably brought on by stress, either physical or mental. However, the herpes simplex virus does give you a warning before it attacks, which is the tingle you feel before the blister appears, caused by the virus moving from where it lies in its dormant state to the skin's surface where it replicates. 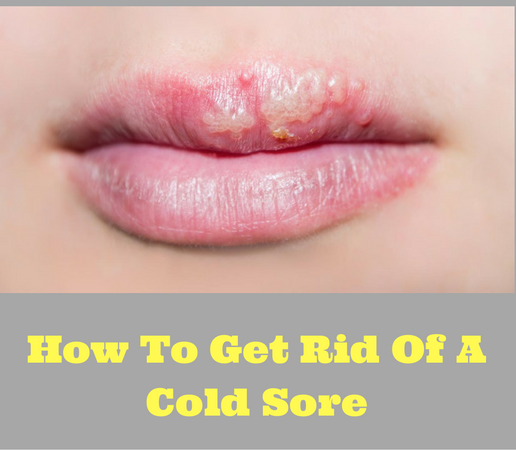 While the body is capable of healing a cold sore without any intervention or help in the form of medicines or other remedies, we can minimize the effects of the cold sore by relieving specific symptoms and encouraging the sore to heal faster. Drying the weeping sore and covering it help prevent secondary infections and spreading the virus, while topical analgesics help with the discomfort caused. · Herpes simplex likes you to consume arginine rich foods that help it thrive, while being inhibited by lysine. You should therefore avoid foods such as nuts, grains and chocolate, which have high levels of arginine for red meat and dairy products which contain lysine. You may also find it useful to adjust the arginine/lysine balance by taking an L-lysine supplement and using topical lysine creams. · One of the simplest treatments for cold sores is to apply ice to the infected area for 15-30 minutes. This seems to interfere with the virus's ability to replicate and encourages it back into its dormant state, therefore lessening the impact and duration of a cold sore attack. · While the pH of the human body is usually around 7.4, which is slightly alkaline, the cold sore virus thrives when the acid becomes acidic, such as when we suffer from an illness such as the common cold or flu, or can happen due to prolonged stress. It is therefore advisable to avoid acidic foods such as tomatoes, carbonated drinks, citrus fruits or vinegar.